There are 9 World Heritage Sites in Morocco. If you're interested in a particular type, use this menu to jump to it. 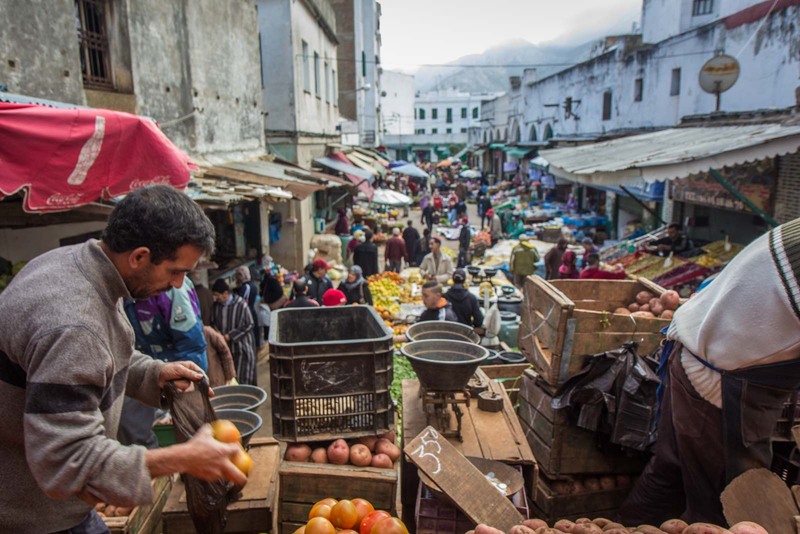 This Moroccan market is small – just a few blocks – but it’s easy to lose yourself amongst the chaos. The narrow streets are full of people, jostling with each other as they walk through, carrying bags or boxes. The stalls seem close together, the sunlight and fresh air struggling for space as much as me. The smell of spices or cooking meat hangs at nose level – no sense is left untouched. I’m loving it. There are no other tourists here, nobody trying to sell me anything just because I’m a foreigner, no souvenirs. It’s authentic. In my mind, I compare this to the famous destinations in Morocco. Some of them are overrun with foreign tourists and there can be just as many local touts and hawkers trying to make a quick buck off the unsuspecting. That’s annoying and I’ve written about dealing with touts here – but, if you can look beyond that, there’s a consistency in the smallest and the largest medinas of Morocco. It’s authenticity. When it comes to the World Heritage Sites of Morocco, this is the attribute that I think is the most striking. Whether they are filled with tourists or taken for granted by locals, the Moroccan World Heritage Sites feel so real. Cities that were created hundreds of years ago have changed little and are used in similar ways today. Those that have evolved over time have not given up their links to the past. There are nine World Heritage Sites in Morocco and I have had the chance to visit them all. Each has impressed me in their own way. It’s likely you have heard of some of them but there are a few that are not on the typical tourist trail that you might not know of already. But every one of them offers interesting ways to get a better understanding of the history and culture of the country. You can see where they all are on this map I’ve put together. 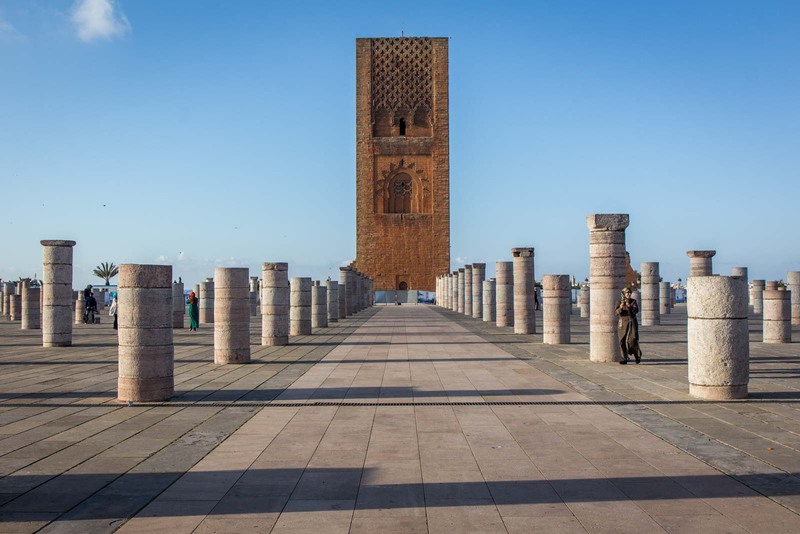 If you’re planning a trip to Morocco, you might be wondering which of these World Heritage Sites you should include in your itinerary. To help you make some decisions, let me quickly run you through each of them with my thoughts on whether they are worth visiting. A few of Morocco’s World Heritage Sites are made up of medinas – the old walled North African cities with a maze of narrow streets. One of the largest and oldest is in Fez. The medina was founded here in the 9th century and grew in the 12th and 13th centuries to about the size it is today. You have to wonder how much it has changed since then. True, some of the stalls now sell smartphone cases or simple electronics, but you’re more likely to see a donkey carrying vegetables being led through the streets. As well as the labyrinth of shops and houses, there are also quite a few beautiful and historic buildings within Fez medina. At many of the madrasas, fondouks, mosques and palaces, you can see the detailed design on their walls and with their structures. One of the madrasas, the al-Qarawiyyin, is said to be the oldest university in the world. There’s a wonderful energy to Fez and it’s one of my favourite World Heritage Sites. Make sure you give yourself enough time to explore it all properly. The other large medina in Morocco on the World Heritage List is in Marrakech. Although it was founded after Fez, it developed into its current form at about the same time and there are a lot of similarities between the two old cities. My feeling is that there are more sights to see in Marrakech, though. The Ben Youssef Madrasa, Bahia Palace, and El Badii Palace are all important historic compounds that you’ll find within the medina and it’s easy to spend a day sightseeing. The city also feels a bit more suited to tourists – a bit smoother around the edges with more boutique accommodation and find dining. Having said that, you don’t need to venture too far off the main streets to find the hectic markets and local chaos. There’s just as much energy here to entertain you for a few days and I loved my time exploring here. After the hectic warrens of Fez and Marrakech, it’s a relief to visit the city of Tetouan at the north of Morocco. This is one of the smallest remaining old cities in the country but is significant because of its proximity to Europe. You can almost see Spain across the water from Tetouan and historically the city was the link between it and North Africa. 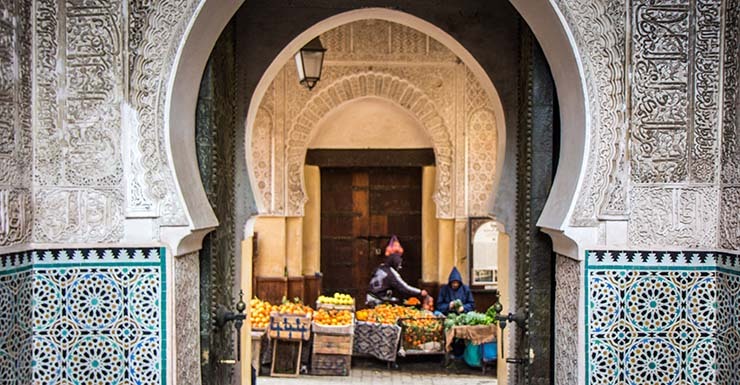 The medina is surrounded by an ancient wall and you can only get in through its grand gates. On Mondays the weekly market is held in the lower streets and the stalls spill out through the gate and into the surrounding area. Tetouan may need seem like a popular tourist spot – and it’s not – but don’t let that put you off. It is worth visiting even if you don’t stay the night (which would be understandable). I would suggest popping in on your way to/from Tangier or going as a day trip. If you can make it on Monday for the market, even better. While most of the Moroccan medinas can feel a bit claustrophic and overwhelming, the one in Essaouira has a much more relaxed atmosphere. I think it’s because it is on the coast, right next to a beach, and so it has the sun and salty air of a resort town. Just outside the main walls is the old port which is a spectrum of blue – the sky, the sea, the painted boats and even the fishermen’s nets are painted blue. But the medina at Essaouira probably also feels less chaotic because of its urban design. It was designed in the 18th century by a French architect who applied some European styles and made the road pattern much more grid-like, for example. The tall wall around the city is based on the Vauban fortifications of France. It’s relatively easy to get to Essaouira from Marrakech and it makes a nice change from the city. Although the medina is historically interesting, the beach makes the city a lovely destination for a break in general. 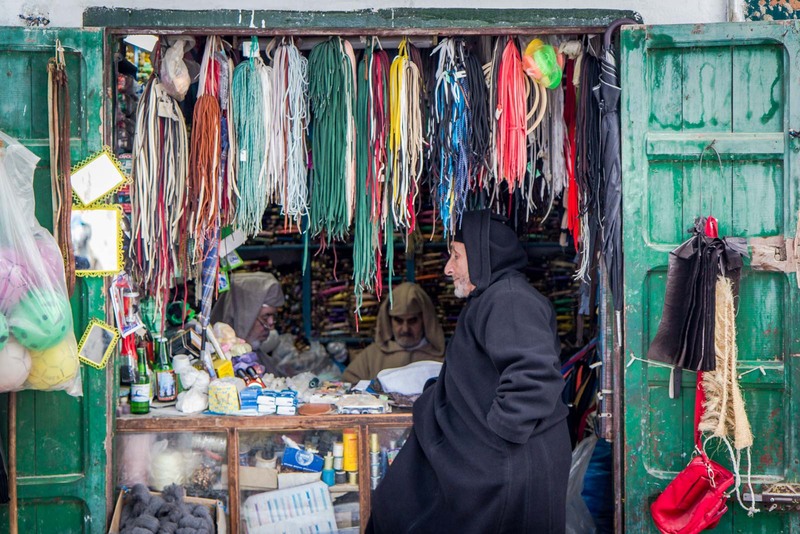 >> My story about the medina at Essaouira? If Marrakech or Fez are the kind of cities where you wander aimlessly for days, then Meknes is a place were you go to see the sights. It is not far from Fez but has a completely different atmosphere – one of historic grandeur and untempered opulence. 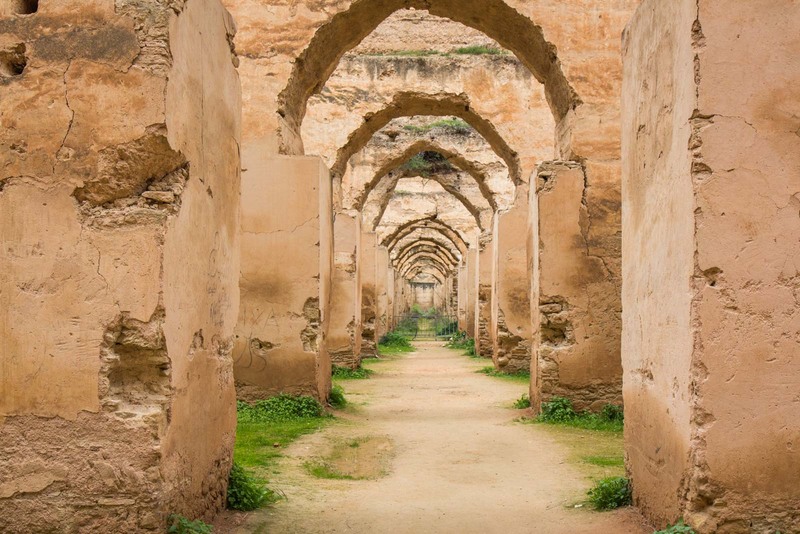 Meknes is the site where the ruthless and ambitious leader, Moulay Ismail, built his capital in the 17th century. The Mausoleum of Moulay Ismail is appropriately grand and the enormous granaries and stables on the edge of town show how wealthy Meknes once was. What really shocked me, though, was going inside the underground prison. Up to 100,000 slaves were chained to the walls at night after working all day building the leader’s legacy. There’s lots to see here and it’s a fascinating place. The tourists that do come here often do it as a day trip but I would suggest staying overnight if you can and give yourself enough time to see everything properly. Most of the World Heritage Sites in Morocco are quite old but Rabat stands in stark contrast to that. The country’s capital city is a modern and efficient place where wide boulevards run between expansive government properties. I confess that it feels a bit unsettling to suddenly see buildings that look a bit like skyscrapers. 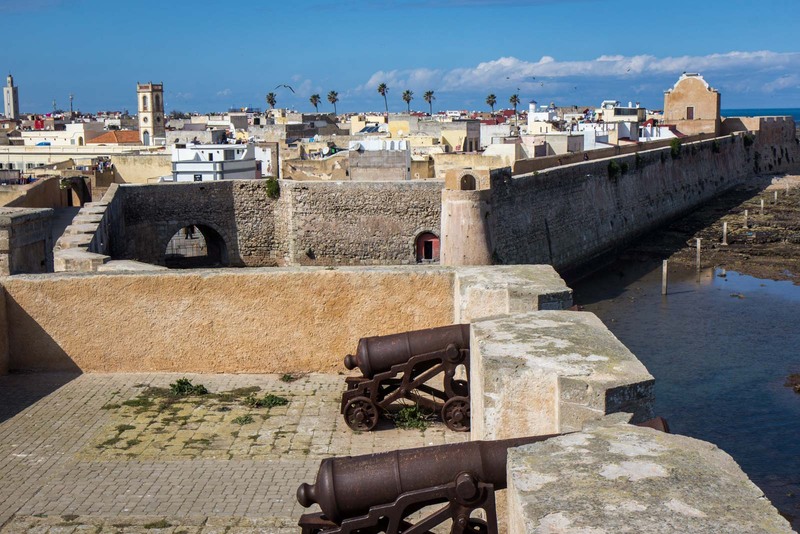 Rabat is on the World Heritage List because of the blend of modern imperial palaces built in the early 1900s by the French and the ancient citadels and Islamic structures from 800 years earlier. The old fortress of Chellah on the edge of town is really interesting, even if it is mainly in ruins. The Hassan Mosque looks like it is in ruins but it is actually unfinished, with a lonely prominent tower at one end dominating the scene. The kasbah by the sea at sunset is also a highlight. I didn’t know much about Rabat before I visited but I’m really glad I did spend a couple of nights to check it out. On the coast of Morocco, past south of Casablanca, is a small town called El Jadida. In the town, on an outcrop by the sea, is the old fortress of Mazagan. It is very small compared to the other walled cities listed as World Heritage Sites and it only takes 30 minutes or so to walk through. But it has a captivating story and is really different from the medinas I mentioned earlier. Mazagan was built by the Portuguese in the early 16th century as an outpost in the trading route down the west coast of Africa. The high walls like cliffs on a coastline with great views across the sea were never penetrated by enemies during the centuries it was in use. But when the Portuguese handed it over to Morocco as part of a peace treaty, they left mines that exploded and damaged the fortress. I really enjoyed seeing this part of Morocco’s history. It’s easy to visit El Jadida as a day trip from Casablanca or you could stay overnight. Over the Atlas Mountains, in the middle of the desert, is a World Heritage Site that is quite unlike any of the other ones in Morocco. It is called the Ksar of Ait-Ben-Haddou and when you arrive, it feels like you have been transported far back in time. 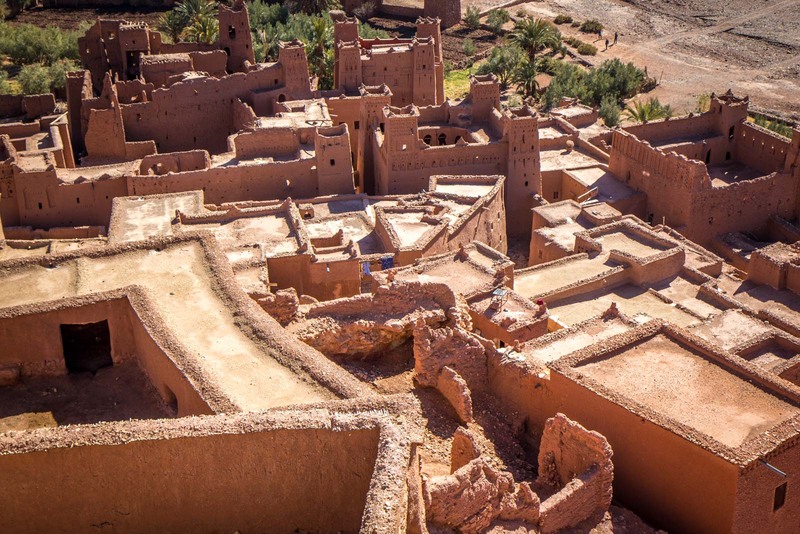 The Ksar of Ait-Ben-Haddou is a fortress built in the 17th century from mud-like substance – wet dirt mixed with straw and rubble packed together tightly. It rises up a hillside from the dusty plain below it and the best way to explore it is to climb the old steps inside the fortress to the top, up the different levels past the small houses and shops inside the earthen citadel. It was used as a filming location from Game of Thrones and you can easily imagine it being a part of that world. 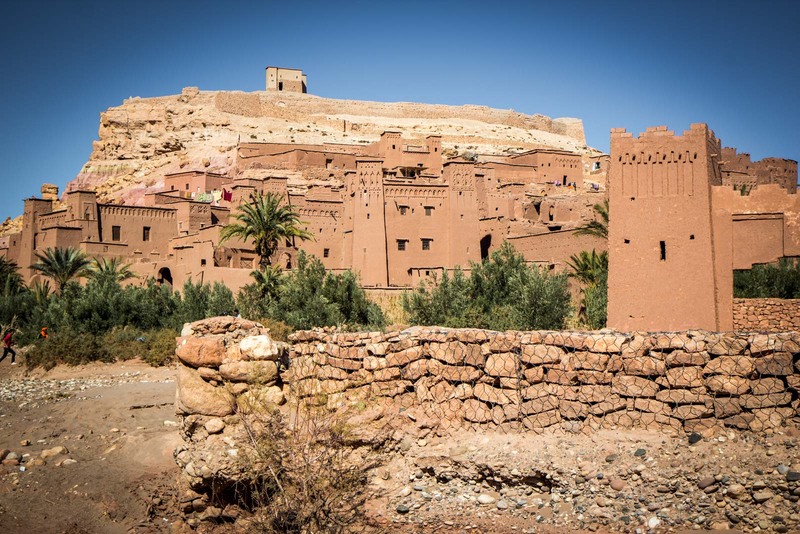 It takes a bit of effort to get to the site but is worth it and there is lots of accommodation in the nearby city of Ouarzazate. The final Moroccan World Heritage Site that I’m going to tell you about is also the oldest. Centuries before any of the other sites had been built, Volubulis was a large and prosperous settlement. It was built by the Romans two thousands years ago as an outpost in North Africa. The fertile lands around it were perfect for agriculture and the city thrived and was expanded several times. It’s in ruins now but you can still get a good sense of what it would have been like when it was full of people. The public spaces, surrounded by the houses of the wealthy, must have been quite a sight to behold! 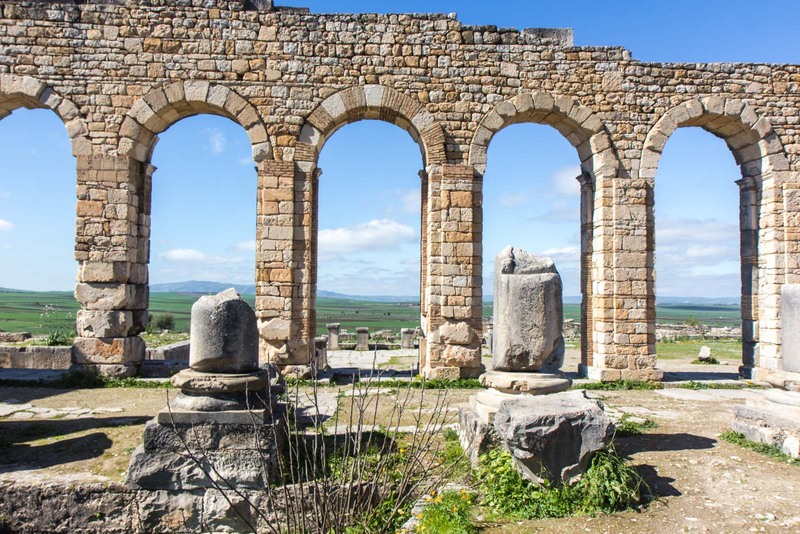 Volubilis is a long way from the medina of Fez – both geographically and culturally. 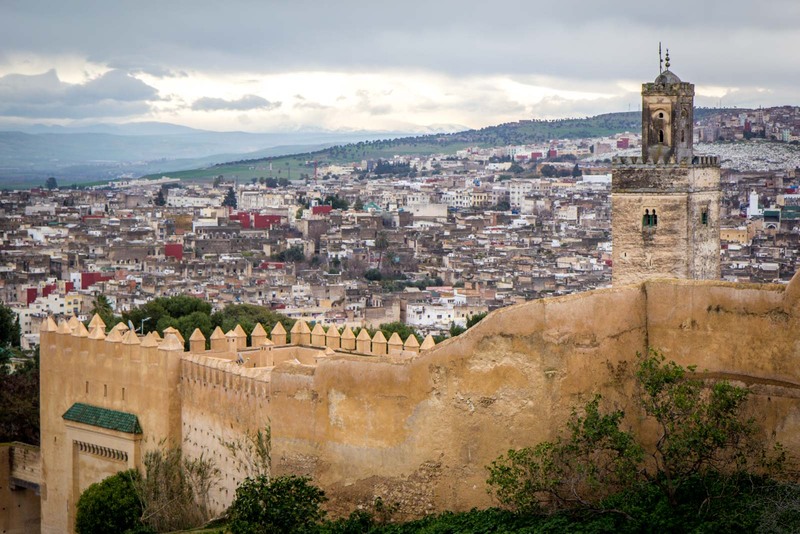 It tells an important story about how this land was used two millennia ago but it also blends into the rest of the history of Morocco, which has been an important trading country and a crossroads of culture ever since. Again, this is part of the charm of Morocco. 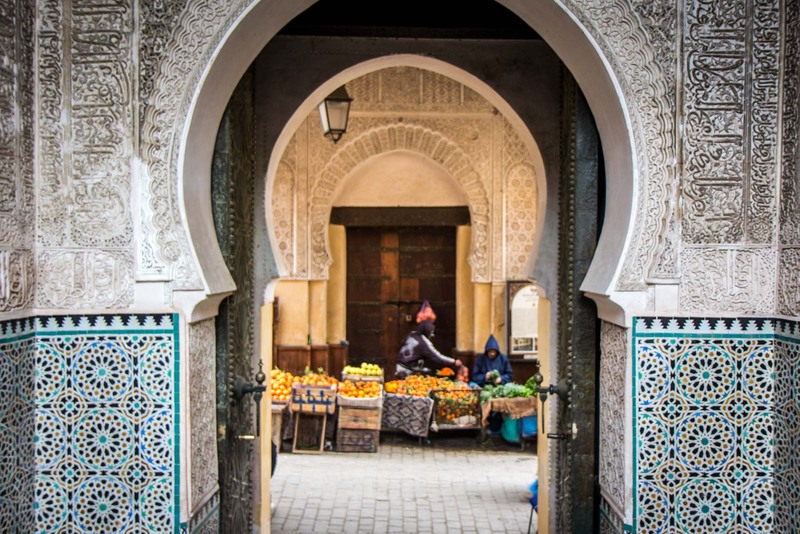 It’s a North African country with a blend of Islamic and European influences that offers opportunities to explore both its history and its modern day culture. And all of it feels so real and authentic, you can’t help but get caught up in the sensory overload of it all. What a beautiful pictures you captured! it looks awesome place to visit. It help me a lot to create my bucket list. Beautiful Morocco, its really looking great for holidays. Its things are best to enjoy here. Historical destination are best to enjoy here. stunning photos you captured of that beautiful city. its really looking great for holidays. Its things are best to enjoy here. Historical destination are best to enjoy here. stunning photos you captured of that beautiful city. Morocco is definitely on my bucket list. Some amazing sights to enjoy.